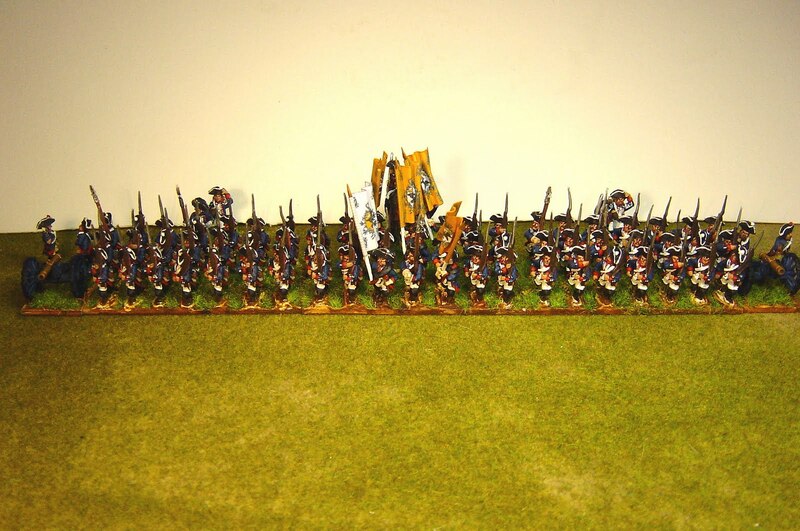 I’ve been meaning to paint up a SYW Prussian battalion in the ‘grand scale’ for some time now. By ‘grand scale, I mean as numerous as possible. I tinkered with doing 5 companies of 23 figures and have ended up with three bases making a total of 69 figures plus a mounted officer and two battalion guns, one at either end. This works out at a ratio of about 1:10. 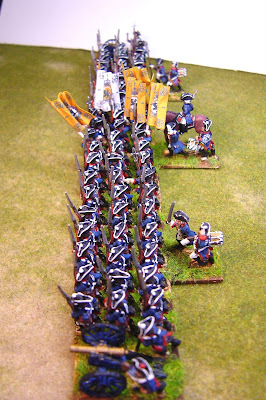 The idea was to be able to see what it looked like in three ranks, to see battalion guns at both ends and so see the full glory of all five flags. 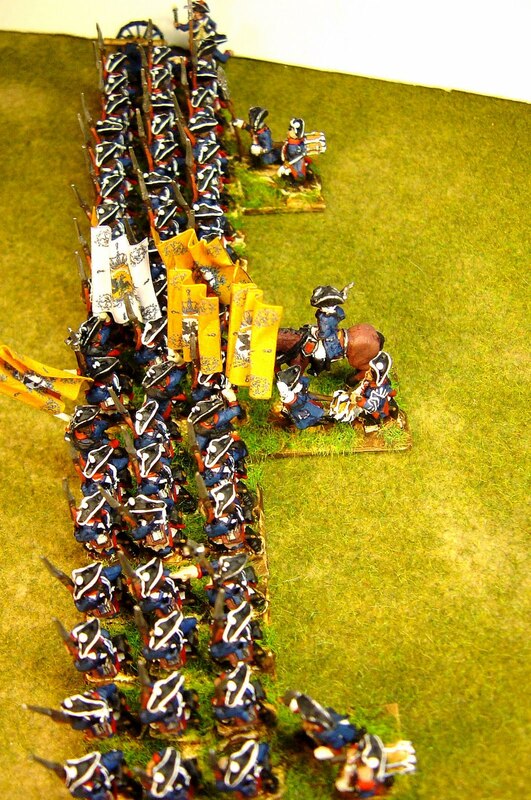 There was no question of doing this in 25mm as a battalion would take up too much space. To me, a battle with just a few battalions per side is just a glorified skirmish and so, if I decide to continue with this and make it a project, then I’d want at least 25-30 battalions and a similar number of squadrons of cavalry at about 12 figures each. This led me away from 'God’s own scale' of 25mm to 15mm. But am I falling into that old habit of biting off more than I can chew? 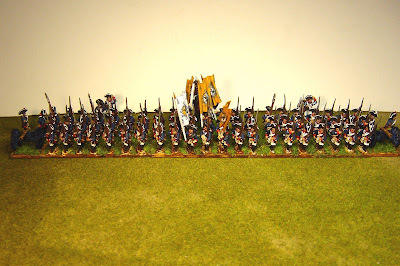 Now I have always liked Old Glory’s SYW 15mm range – back in the 1980’s I had huge 15mm SYW armies, all of which have long since been sold but some of which might be coming home! More about that another day. The other thing I really like are Eureka’s SYW range – in particular the one-piece casting cavalry which are on splendidly large horses. So, for reasons of economy (OG are much cheaper) I can see a large project developing here using OG infantry and Eureka cavalry. The other advantage is that Eureka will supply their horses on their own, if you ask them nicely, and so OG command bags can be re-mounted. Frankly the only disappointment in the OG range is that their cavalry is mounted on pigmy horses, well pigmy when put side-by-side with Eureka’s. This is, at the moment, just a mini-project – a ‘see-if-I-like-it’ effort. 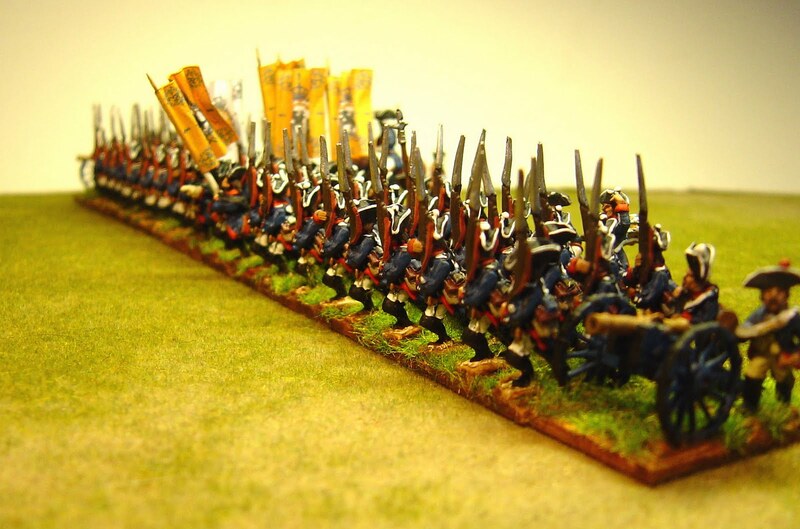 I have ordered some Austrians and will soon paint an Austrian battalion in four ranks (four flags as I’m going with a WAS organisation of 4 companies) but with the forth rank on its own base so that I can redeploy post-Kolin into three ranks. As I use computer rules (C&G II) the number of bases is irrelevant as one inputs the number of men in the battalion and the number of companies/platoons as was historically correct. Companies were organisational entities in this period and of no importance to firing which was normally done by platoon or division of platoons. Prussian battalion carried five flags in this period (one per company) and these were grouped in the middle of the battalion in a manner like a 5 on a die. What I don’t know is where the Leibfahne was within this system. I have placed it at the front and on the right, the position of honour (and at the suggestion of Christian Rogge) but it could also have been in the centre. 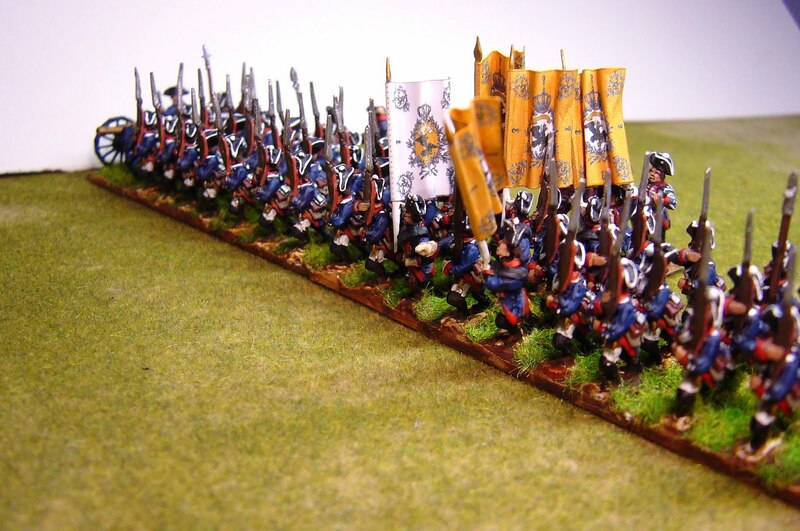 Because this is the first battalion, there is one Leibfahne and 4 Kompaniefahnen. I have chosen to depict IR 1 Winterfeldt as, in my eyes, it was the classic Prussian uniform. I still like 25mm of course (there is a very satisfying weight to each base and the uniform detailing is much more evident and fun to paint) but I have dozens of 15mm houses so gaming 15mm will not involve additional cost in buying more terrain. Do please let me know what you think.